My wife and I started our quest in Harry and Selma’s old neighborhood- The Bund, Shanghai. 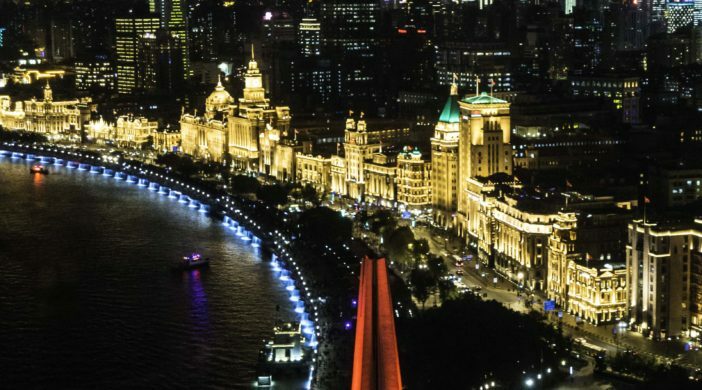 Thanks to renovations, The Bund of the ’30s lives on today as a grand symbol of historic cultural ignorance and mercantile invasion by the British, French, Americans and Japanese. 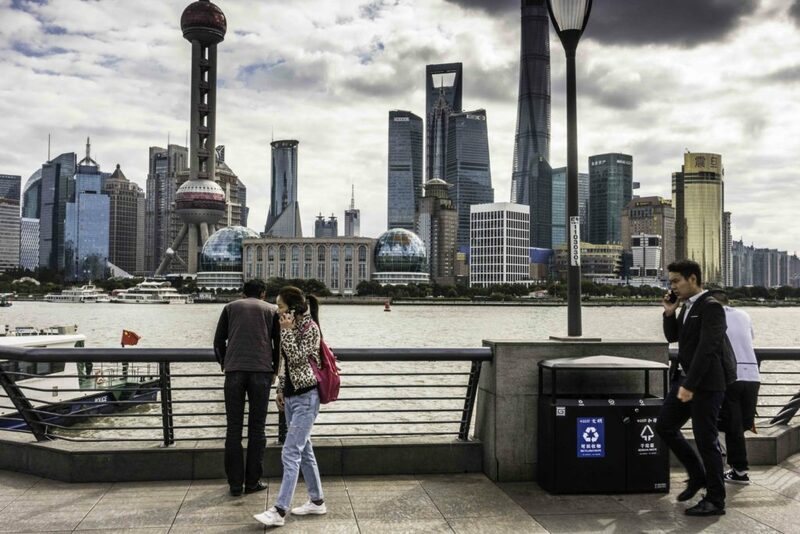 As NPR correspondent Rob Gifford observed in his 2007 book “China Road“, Chinese tourists on The Bund boardwalk want to have their pictures taken against the impressive modern skyline lying across the Yangtze River as they embrace China’s future. In contrast, Europeans favor photos with the historic buildings in the background, i.e., embracing the past. With nostalgia, wanting to revisit the lives of Harry and Selma, we initially fell into the latter trap. 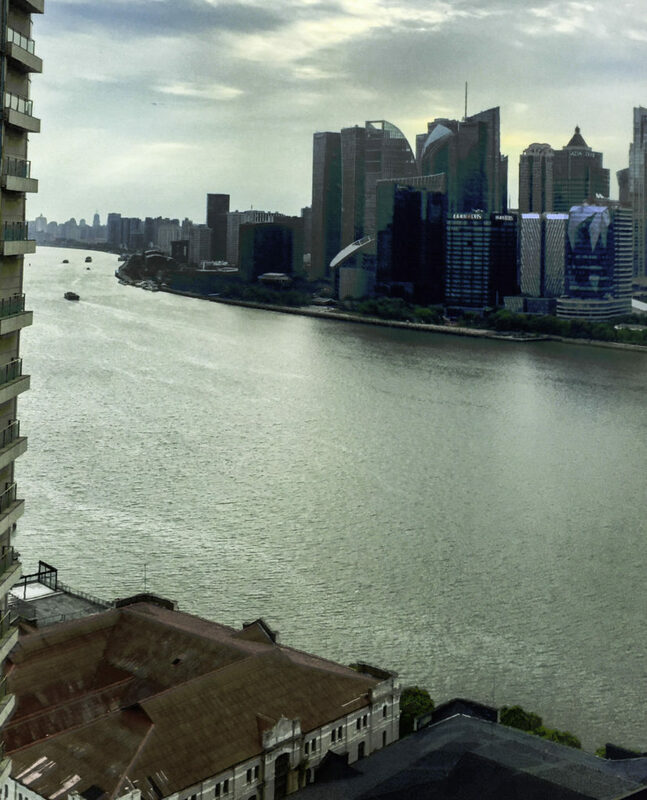 The Settlement: The grand Shanghai of the 1900s, known to Harry and Selma as “The Settlement”, was located on the Yangtze (Huangpu) waterfront embankment, i.e., known at that time and now as The Bund. In the 1930s it was the financial hub and economic powerhouse of the “Orient”. 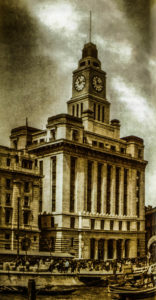 The Bund had the largest bank in the British empire, HSBC (Hong Kong Shanghai Bank Corp.; #12 The Bund); also, the Mercantile Bank of India, London and China (#4), St. Petersburg Russo-Asiatic Bank (#15), Yokohama Specie Bank (#24), French Banque de l’Indochine (#29), Bank of China (#23); and, the Customs House (#13). 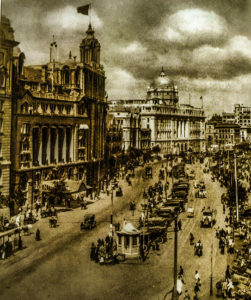 In the ’30s, only a short walk along The Bund was needed to reach shipping companies, insurers, grand hotels, elaborate restaurants and the British, Japanese and Russian consulates. 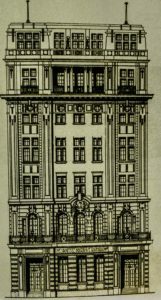 The HSBC building at #12 also housed the Asian office of the American Bank Note Company where Harry was Vice President. His company designed, engraved, printed and shipped currencies to most of the banks and governments in Southeast Asia. China in 1928-29: When Jiang Jieshi (Chiang Kai-shek) established military control over all China in 1928 his new capital was Nanking (aka Nanjing), just up the Yangtze River from Shanghai. China was in financial ruin with massive foreign debt (at the time more than $1.5Bn US); half in arrears; and one third unpaid interest. The debt negotiated by foreign bankers was secured by Chinese Customs Tariffs, collected at the Customs House, #13 The Bund which was run by a British director. 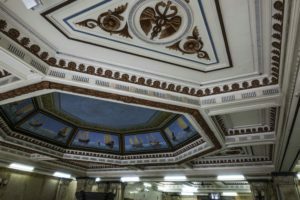 Foreigners on The Bund lived lavishly, but the Chinese government was bankrupt. As a result, the Chinese government consulted noted economist Professor Edwin Kemmerer and his colleagues at Princeton University who assembled a team of American financial experts to help create solvency. The commission worked at the China Central Bank building, #23, from 1929 to 1930 and came up with a plan to rescue China from its creditors. To reconcile and renegotiate Chinese debt, they recommended linking China’s trade to a new monetary unit called a Customs Gold Unit (CGU). From his offices at #12, Harry negotiated the 1930 contract with the Bank of China for printing the new CGU banknotes. Thereafter, customs duties collected from foreigners at The Custom House were paid in CGU. The CGU approach worked magnificently to capture the roaring growth that China experienced as it opened to the West. By 1934 the Chinese government was financially solvent. Speaking to the great joys and lavish lifestyle in Shanghai at that time, many of Professor Kemmerer’s financial experts decided to stay on in Shanghai as employees of the Chinese government. The Bund Boardwalk Today with the Big Ben replica clock tower of the Customs House to the right and the new skyline to the left – the boardwalk of today covers the muddy river bank that was the major site of British opium imports from India in the 1920s. 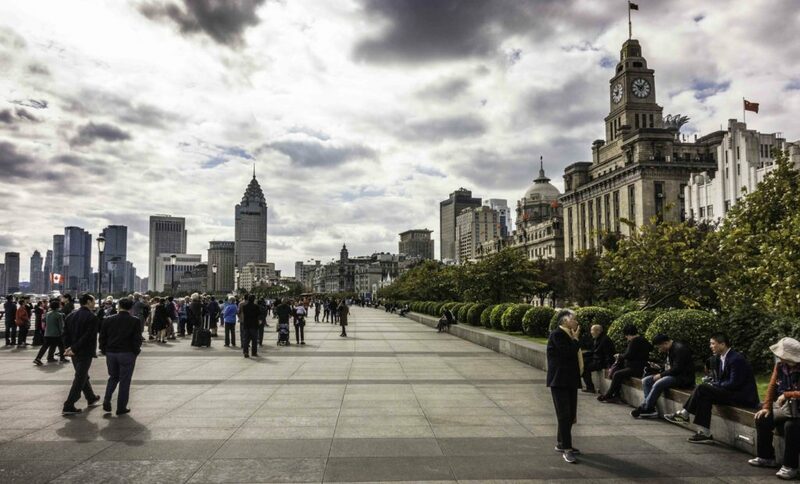 Restoration of The Bund: In the 1990s, China decided to restore The Bund. The highly visible results revive the beautiful art deco styles of the ’30s along with the extraordinarily opulent lifestyle and decadence that was the roaring twenties and lavish thirties in China. Social status and entertaining, of course, facilitated business dealings. 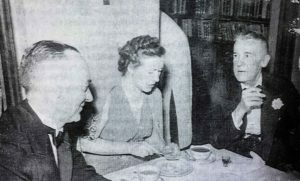 While the ex-pats socialized, China was being destroyed by bitter in-fighting between rival factions in the Guomindang (GMD) government in Nanking; communist rebels in Wuhan; and widespread graft and corruption. Seeing these weakness, it is small wonder that international events were about to overtake The Bund. War: The roaring ’20s-’30s all came to an abrupt end in the nine month wartime siege of 1937. The east end of The Settlement included the Japanese concession naval yards and anchorage for the Japanese cruiser “Idzumo.” From there it shelled Chinese army positions near The Bund. 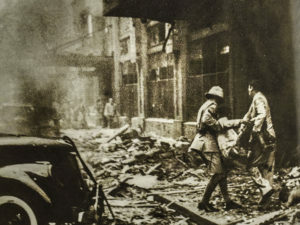 Chinese bombs targeting the cruiser Idzumo and the Japanese consulate missed and instead hit the Palace (#19) and Cathay (#20) hotels just down the Bund from my Uncle’s office (#12) and very close to his and Selma’s penthouse residence (#26). Hundreds of civilians lost their lives. Selma wanted to leave China but Harry felt responsibility for the office and thought things would blow over. 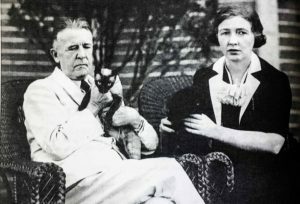 Harry did agree to move out of the war zone which was now The Bund, to a new home near the race track off Nanjing Road. That November, facing countrywide advances of the Japanese, the Chinese army withdrew to defend Nanking. Shanghai was left to the imperial Japanese army. Since Japan was not yet at war with the US, Britain or France, the Japanese troops withdrew into the Japanese concession but administered all of The Settlement. With the occupation came monetary restrictions and food shortages. Life in The Settlement became increasingly difficult in 1938-40, but yet more difficulties were soon to come. In June 1942, some captured American government officials were repatriated by Japan. In August, Harry passed away from a heart attack. On February 24, 1943, Selma, an American citizen by birth, age 52, was labeled an “Enemy National” and received notice to report to an internment camp in Chapei. Despite severe illness, she survived the war. The Bund Today: The Bund today appears as opulent as Selma described. 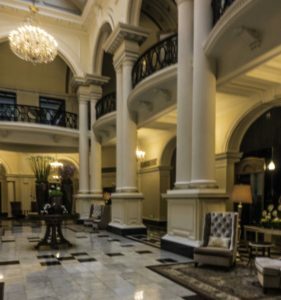 The grand neoclassical stone buildings constructed at the turn of the century have elegant lobbies of marble and exotic hardwoods, beautiful mosaics and elaborate frescoes. 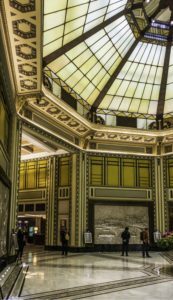 The Waldorf Astoria hotel, Bund #2, that once housed the Shanghai Club, (the British gentleman’s club where Harry had his lunch), is amazing for its beautiful marble and art deco style. I could imagine Harry standing at the 110-foot long bar in 1928 sipping his gin and tonic and lording the US polo win (8 goals to 5) over Britain in the 1927 International Polo Cup. 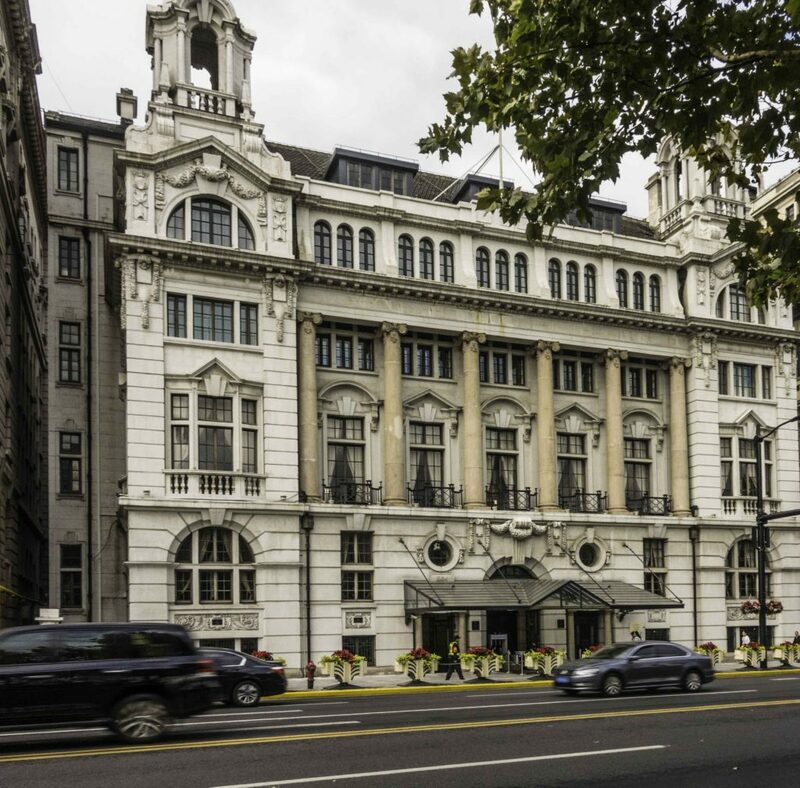 The Bund #9, housed the offices of Russell & Company which was home to the China Shipping Merchant Company. It was the largest American trading house in China and is probably how Harry shipped his new Cadillac or Buick back to China each year. HSBC is still the tenant at Bund #12. 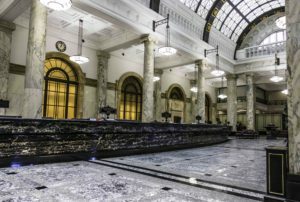 Today, as in the 1900s, the opulent building stands as a statement to the financial might of HSBC, (but we didn’t see many tellers or clients inside). 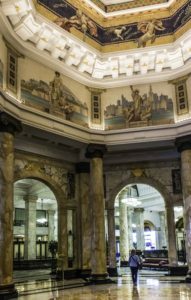 The Palace Hotel, #19, is now The Fairmont, complete with a classic tearoom and art deco lobby that is straight out of the 1920s. We had lunch at their cafe. 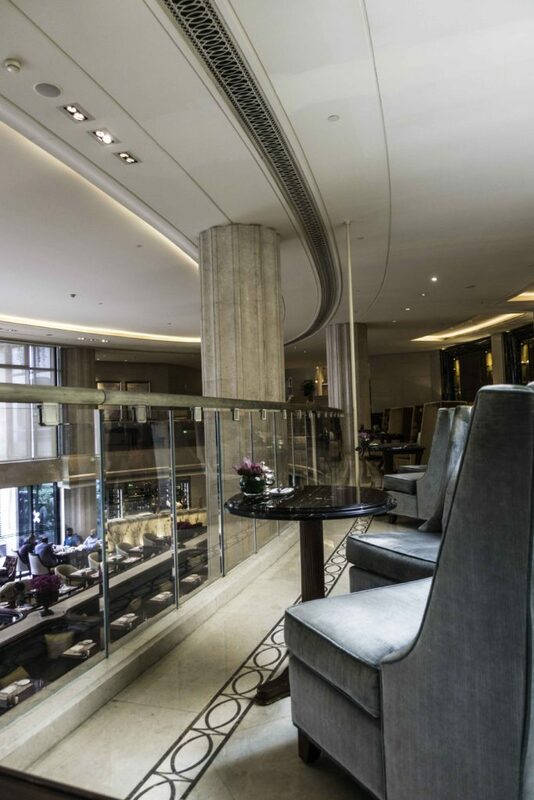 In the Waldorf Astoria/Shanghai Club, #2, we experienced an elegant tea time in the art deco gallery with by elegant white marble columns, standing on a floor of white marble with black Arts Décoratif marble inlay and by walls of black marble wainscoting. Tea was served, of course, in a genteel 1930s manner complete with Sterling silver tea service. It took us back in time to a lifestyle enabled by vast disparities in wealth and by beliefs in superiority of the white race. When our bill came we were a bit taken aback, but upon reflection, happy that the social stigmas are gone along with the vast disparities in wealth. For us it was an expensive interlude that gave us a small glimpse of the extraordinary lives enjoyed by ex-pats in ’30s Shanghai. Nanjing Road: Always the shopping road, even in the 1930s, Nanjing Road is now shopping on steroids. In the ’30s the road led from The Bund to the horse races, Polo grounds and train station. 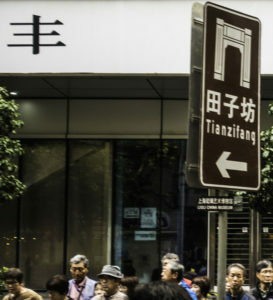 Today much of the street is closed to make a huge open-air pedestrian mall composed of an eclectic mix of historic 1900s buildings surrounded by ultra-modern neo-Chinese towers. We made the mistake of walking down Nanjing Road on a Saturday, a shopping day. 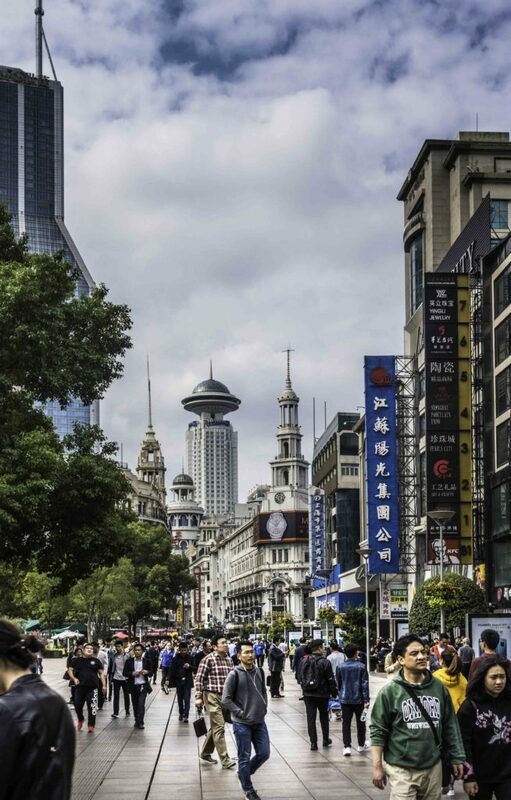 It seemed all of Shanghai was out for a stroll: families with children in backpacks and strollers, girl friends, young couples – all shopping but very few signs anyone was buying anything. Smiles on the faces of people coming toward us told a story of contentment. New Mercedes, BMWs, VWs, Audis and Toyotas on the new Shanghai freeways told the same story. China has come a long way in establishing upward mobility for some of its people. Our visits to several stores revealed US prices of women’s and men’s apparel. Since most Chinese earn less than in the US, we saw a lot of heavy looking but less buying. 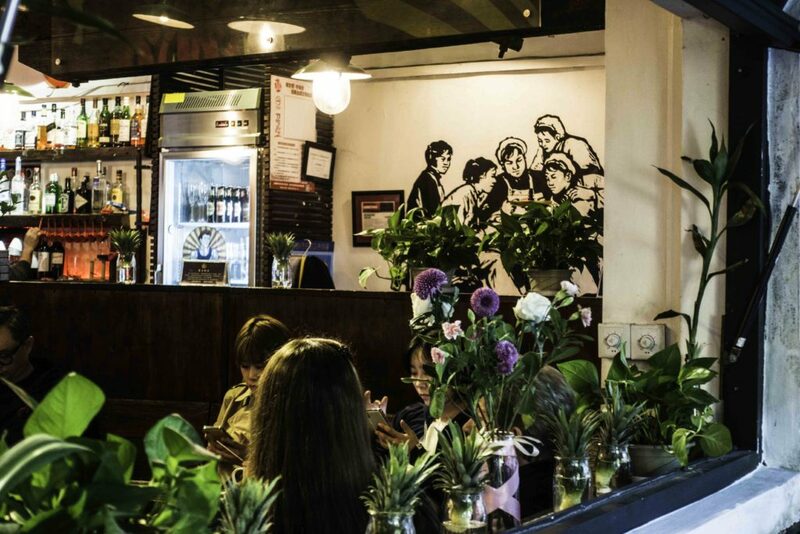 Tianzifang: We were looking for a more artsy authentic Shanghai shopping experience so we flagged down a taxi and headed out to the 1930s historic French Concession. In Tianzifang, I found my minds-eye-imagination of what I thought shopping would be like in Shanghai. 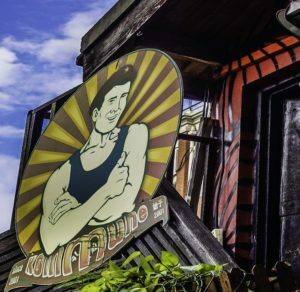 With its narrow winding alleys, art galleries and shops with handmade curios, it wasn’t long before we needed a respite. Seated at the outdoor “Kommune” café, we had a chance to catch our breath and observe the passers-by: Chinese, Australians, Europeans and some Americans. The English speaking waitress and English language menu with burgers and sandwich wraps provided ample evidence this area was an authentic tourist trap- so much for my naive minds-eye-imagination. Despite the obvious warning, I have to admit we enjoyed browsing the small shops filled with local (“Made In China”) crafts. Eventually we succumbed, me for a black sweatshirt with a robotic rooster signifying my “chicken-little” propensity for thinking the sky (stock market) is falling; my wife for a robotic tiger, signifying her indomitable spirit. Sadly, our time in the amazing modern city of Shanghai was too short and we didn’t have time to explore widely, but fortunately, that means more is left for next time. With nostalgia for life-gone-by satisfied, we too sought to have our pictures taken against the skyline of the emergent city that is today’s modern Shanghai. Next stop: a Three Gorges Yangtze river tour departing from Chongqing. IF YOU GO: The Waldorf Astoria (formerly the Shanghai Club #2), Fairmont Peace Hotel (formerly the Palace #19 and Sassoon/Cathay #20 ) are located directly on The Bund. There are a number of hotels located just blocks off The Bund. We stayed at The Hyatt on the Bund. At the top of the Hyatt, The Vue bar, is definitely worth a visit at night. 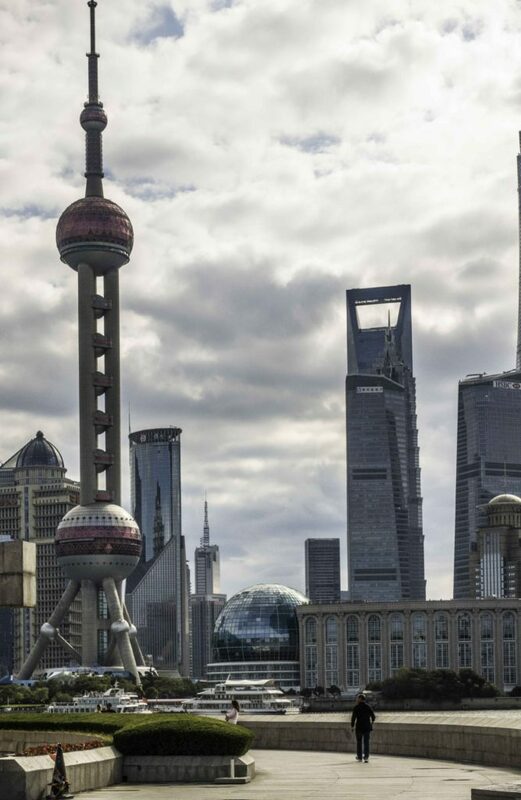 As its name suggests, it has amazing views of Shanghai and especially The Bund. If you’re not a hotel guest, a reservation and cover charge are required. Local Chinese fluent in English are often difficult to find, even in Western hotels, and especially when you need them, so plan ahead. momentous era. Harry was an incredibly brave stoic who unfortunately paid the price when he succumbed from a heart attack. To know that Selma lived for many more years after returning to America really warms my heart. Great photos recapture the feel of the Thirties and the economic power of present day Shanghai. Good stuff and it filled me in a lot as my uncle Carl was out there during the same period as Selma, working for the British American Tobacco Company. All I remember of his internment was it started at the “Bridge House” and then on from there. The few letters we got from him were highly censored and he once remarked that he always traded his Red Cross-cigarettes for the chocolate bars. He bought a 49 Lincoln for his return trip to China but of course the Communists were coming so he remained in Los Angeles. Unlike Selma, he developed a taste for Gin in Shanghai and only lived into his early 60’s. Interesting interweaving of personal family history with contemporary travelogue. 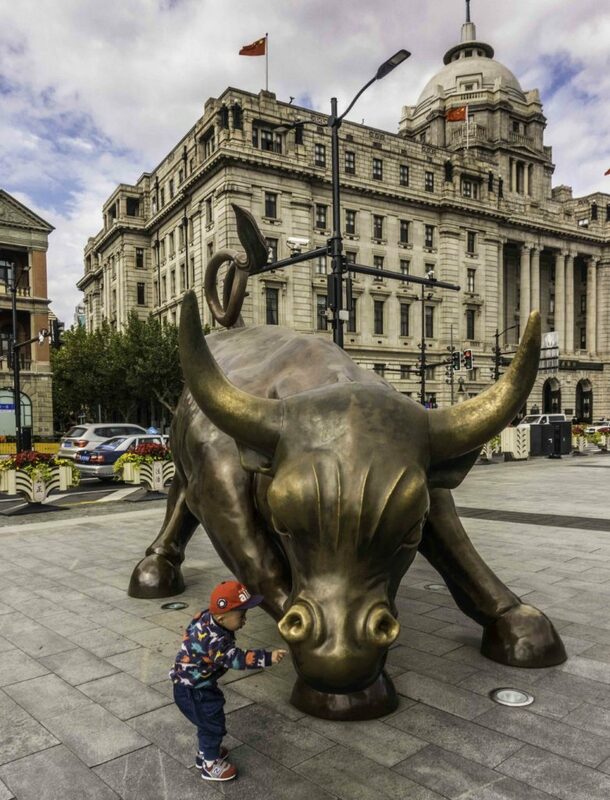 Fabulous picture, by the way — the little boy with the Wall Street bull on The Bund. Many claps and congrats on that. Fascinating to have a first-hand family reason to go to explore the place. Difficult, reading the aunt’s depiction of the lifestyle of some of the women, to reconcile their decadent ex-Pat lives with what was going on around them. Whew. Interesting how you’ve woven it all together. Makes for a good read.